Annalee Doll Description: Last one. Open eyes, tan body, red, white and blue saddle and reins, holds American flag "VOTE" sign. Great gift for any Democrat, Donkey or Mule collector. Never put into production - one of a kind! Companion is 112603. Annalee Doll Description: Open eyes, mouth expression may vary, grey tabby, red/white/blue Uncle Sam hat, red mittens, sits on Patriotic blanket. Cat is not attached to blanket. This little kitten is a Sue Coffee Custom Classic. It was never in the Annalee line and only available on suecoffee.com. Only 10 were made. Annalee Doll Description: Open eyes, open mouth, grey hair, grey and white stripe body, red/white/blue Uncle Sam hat. Facial expression may vary slightly from photo. Sue Coffee Custom Classic and was not in the regular Annalee line. Only 25 produced. Annalee Doll Description: Open eyes, black furry body, red with white polka dot collar with silver bell, red/white/blue Uncle Sam hat. This little black Scotty pup is a Sue Coffee Custom Classic. It was never in the Annalee line and only available on suecoffee.com. Only 10 were made. Annalee Doll Description: Open eyes, black and white body, houndstooth print sash, wears red/white/blue Uncle Sam hat. This adorable Patriotic Penguin is a Sue Coffee Custom Classic. It was never in the Annalee line and only available on suecoffee.com. Only 10 were made. Annalee Doll Description: Sue Coffee Annalee Custom Classic. Open eyes, brown body, mane and tail. Red/white/blue saddle wearing an Uncle Sam hat, red bridle accented with brass bells. Looks great displayed with any of the Sue Coffee Exclusives: Patriotic Boy, the Patriotic Girls, Patriotic Clown, Patriotic Donkey, Patriotic Elephant or the Sue Coffee Uncle Sam. Perfect addition to your Patriotic display or parade! Larger Sue Coffee Custom Classic White Patriotic Pony is item 987703. This Sue Coffee Custom Classic was never in the Annalee line and only available on suecoffee.com. Annalee Doll Description: Open eyes, ivory colored body, hair, mane and tail, red/white/blue Patriotic Uncle Sam hat. This Patriotic Lion is a Sue Coffee Custom Classic and was not put in the Annalee line and only available from suecoffee.com. It is 8" tall from the bottom of the feet to the top of the hat. Only 10 were made. Annalee Doll Description: Open eyes, brown body, beige antlers, wreath around neck decorated with pine cones and red berries. One face produced. This Patriotic Moose is a Sue Coffee Custom Classic and was not put in the Annalee line and only available from suecoffee.com. It is 8" tall from the bottom of the feet to the top of the antler. Only 10 were made. Annalee Doll Description: Open eyes, closed mouth, flesh-colored face, ears, hands, and feet, brown body, red/white/blue Uncle Sam hat. 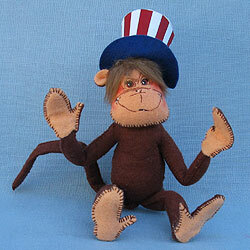 This adorable Patriotic Monkey is a Sue Coffee Custom Classic. It was never in the Annalee line and only available on suecoffee.com. Only 10 were made. Annalee Doll Description: Open eyes - as shown, Holstein cow has white body with black spots, red/white/blue Uncle Sam hat, red and white apron accented with a red bow, green base with patriotic overlay. This adorable Patriotic Cow is a Sue Coffee Custom Classic. It was never in the Annalee line and only available on suecoffee.com. Only 10 were made. Annalee Doll Description: Open eyes, brown and black body, wears a red/white/blue Uncle Sam hat. This Yorkshire Terrier is a Sue Coffee Custom Classic and was not in the regular Annalee line. Only 10 were made. Annalee Doll Description: Open eyes, grey hair, grey body, Uncle Sam hat, blue saddle, red/white stripe blanket with three white stars on each side. Companions are 981703, 98460, 984400 and 982302. A great gift for any Republican or Elephant collector. Sue Coffee Annalee Exclusive. Annalee Doll Description: Open eyes, grey body with grey mane and tail, wears Uncle Sam hat, blue saddle with red and white stripe blanket with three white stars. Companions are items 984400, 984601, 982302, and 981503. Great gift for any Democrat, Donkey or Mule colector. Sue Coffee Annalee Exclusive. Annalee Doll Description: Open eyes, open mouth with tongue, white sparkle outfit with blue stars with red streamers, Uncle Sam style matching hat with blue brim, blue removable felt base. Sue Coffee Annalee Exclusive. Made in Meredith, NH USA. Annalee Doll Description: Open eyes, closed mouth, white sparkle outfit with blue stars with red streamers, Uncle Sam style matching hat with blue brim, blue removable felt base. Sue Coffee Annalee Exclusive. Made in Meredith, NH USA. Annalee Doll Description: Open eyes, open mouth with top teeth smiling, white sparkle outfit with blue stars with red streamers, Uncle Sam style matching hat with blue brim, blue removable felt base. Sue Coffee Annalee Exclusive. Made in Meredith, NH USA. Annalee Doll Description: Winking, open mouth smiling, white sparkle outfit with blue stars with red streamers, Uncle Sam style matching hat with blue brim, blue removable felt base. Sue Coffee Annalee Exclusive. Made in Meredith, NH USA. Very few winks are left. Annalee Doll Description: Sue Coffee Annalee Custom Classic. White body with fluffy - glittery mane and tail. Red/white/blue saddle wearing an Uncle Sam hat. Looks great displayed with Uncle Sam. He can even ride this horse in the parade!